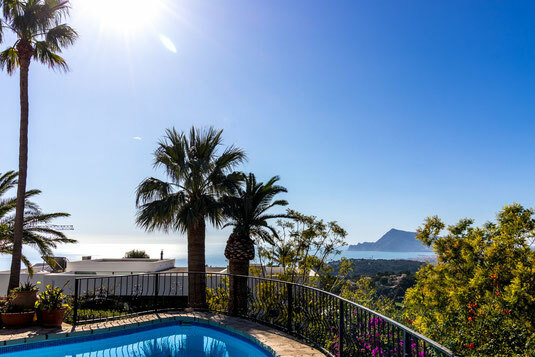 12) Apartment Dorada-up till 4 persons, Overlooking the sea from your spacious terrace - Rent,a,House,Spain, holiday, bookings, Altea,La Vella,, Albir, Calp(e), Moraira, Javea, Benidorm, Alfaz del Pi, La Nucia, Alicante, Valencia. Overlooking the sea, the golf course and Altea from your private swimming pool and villa. REF: 106. Luxury villa for 4 persons and view over the golfcourse and Altea. This beautiful villa has a living room with large flat screen Satellite TV with international channels, 6 persons dining table inside and a 6 persons dining table on a covered terrace by the kitchen, 2 double bedrooms, 1 bathrooms with walk inn shower, compleet kitchen, garage, terrace by the pool with a lounge set where you have a magnificent view over the sea and where you can enjoy the beautiful sunset. For a small family the ideal place to spend your payable holiday, in your own private villa. 500 Euro per week exclusive electricity January. 500 Euro per week exclusive electricity February. 500 Euro per week exclusive electricity March . 600 Euro per week exclusive electricity April. 800 Euro per week inclusive 200 KW electricity June . 1000 Euro first two weeks July inclusive 200 KW electricity. 1250 Euro last two weeks July inclusive 200 KW electricity. 1250 Euro per week inclusive 200 KW electricity August. 800 Euro per week inclusive 200 KW electricity September. 650 Euro per week exclusive electricity October . 500 Euro per week exclusive electricity November . 500 Euro per week exclusive electricity December . Month prices in the winter from 1250 a month, other long term prices please ask us.